Ann Arbor public art commission meeting (Nov. 30, 2011): At their final meeting before the city council convenes on Monday night (Dec. 5) to consider changes to Ann Arbor’s Percent for Art program, public art commissioners debated how to respond – particularly to a temporary funding cut – and expressed different views on what their role should be. Former board chair Margaret Parker, who was instrumental in creating the Percent for Art program in 2007, argued passionately that commissioners should be strong advocates for it. Saying she didn’t believe councilmembers really understood the issues that AAPAC is facing and that the currently proposed changes represented an “incredible kink in the road,” she urged commissioners to attend Monday’s city council meeting and speak against the proposed changes during the public hearing. Parker also argued that the council should double the budget for administrative support to public art projects – from 8% to 16%. Marsha Chamberlin, AAPAC’s current chair, questioned whether commissioners should “pick a fight” with city council, and said she felt that councilmembers did understand the issues clearly. Noting that she had attended previous council meetings and also communicated with councilmembers privately, Chamberlin wasn’t convinced that turning out yet again would be effective. The councilmember who has in the past advised AAPAC about the sentiment on council – Tony Derezinski, who also serves on AAPAC – did not attend the Nov. 30 meeting. Malverne Winborne pointed to political realities at play, and said that AAPAC needs to be realistic about the situation – other programs are being cut, too. If the council decides to get rid of AAPAC, he said he wouldn’t fight that. “Decommission me – what the hell,” he quipped. In addition to an extended discussion on city council’s proposed changes to the Percent for Art ordinance, commissioners voted to move forward on two projects: (1) public art in a proposed rain garden at the corner of Kingsley and First, and (2) a partnership with the Detroit Institute of Art’s Inside|Out project, which involves installing framed reproductions from the DIA’s collection at outdoor locations on building facades or in parks. Commissioners were also briefed on a range of other projects, including the latest on a mural at Allmendinger Park. A task force has selected four finalists for the $10,000 project: (1) Robert Delgado of Los Angeles, Calif.; (2) Bethany Kalk of Moorehead, Kentucky; (3) Jefferson Nelson of Liberty Center, Ohio; and (4) Mary Thiefels of Ann Arbor. The artists will submit preliminary concepts for potential murals on Dec. 8, and from those, the task force will recommend one for AAPAC and the city council to consider. Commissioners also changed the date for AAPAC’s final meeting in December – to Dec. 13, when they’ll hold a follow-up discussion to their Oct. 26 working session. That October session, intended to prep AAPAC for its presentation at a Nov. 14 council work session – focused on challenges facing the Percent for Art program, and possible solutions. As part of his administrator’s report, Aaron Seagraves – the city’s public art administrator – updated commissioners on the status of proposed changes by city council to the Percent for Art ordinance. By way of background, the city enacted a law in 2007 that requires all capital project budgets to include 1% for public art, with a limit of $250,000 per project. Since then, there have been previous unsuccessful attempts by some councilmembers to reduce the percentage allocated to public art. This most recent proposal, which the council approved on an initial vote at its Nov. 21 meeting, would temporarily reduce the amount allocated from all capital project budgets to public art from 1% to 0.5%. A sunsetting amendment would require that future funds reserved for public art under the ordinance, starting in fiscal 2012, must be spent or allocated within three years. Money that is unspent or unallocated after three years must be returned to its fund of origin. This applies only to “pooled” funds – from Percent for Art money funded by parks, stormwater or solid waste projects, for example, and not for specific building projects like the proposed Fuller Road Station. The proposed revision would also make it possible for the council to extend the deadline for successive periods, each extension for no more than six months. For the purposes of the public art ordinance, a definition of capital improvement projects would exclude sidewalk repair from the ordinance requirement. Voters on Nov. 8 approved a new 0.125 mill tax that is supposed to allow the city to take over responsibility for the repair of sidewalks. Previously, sidewalk repair was paid for by adjacent property owners. Any capital projects funded out of the general fund would be excluded from the Percent for Art requirement. Such projects are rare. When it became clear earlier this year that a proposal to reduce the Percent for Art funding would be brought forward to the city council, AAPAC commissioners and others in the arts community began lobbying informally as well as speaking during public commentary at city council meetings. The council focused on the Percent for Art program at its Nov. 14 working session, which included a presentation by AAPAC chair Marsha Chamberlin and by Sue McCormick, the city’s public services area administrator, who oversees the program. AAPAC held an Oct. 26 working session to prep for the Nov. 14 presentation to the council. At that meeting, commissioners cited a range of challenges facing the program, including: (1) a lack of public awareness about the program, its constraints, funding sources, and AAPAC’s role; (2) the perception that not enough art is coming out of the program, and that the process is too slow; (3) the complaint that local artists aren’t given preference; and (4) the sense that in this difficult economy, city funds shouldn’t be spent on public art. In addition to offering ways to address these challenges, at the Oct. 26 session commissioners also discussed their own workload. They noted that AAPAC is still relatively new and is one of the few city commissions that hasn’t enjoyed consistent staff support over the years. Although a new part-time public art administrator was hired this summer – Aaron Seagraves – the program had no dedicated staff person for about a year. On Nov. 30, Seagraves reported that he thought the Nov. 14 work session with city council had gone well, and that the information about the Percent for Art program had been well-received by councilmembers. Based on his observation of the subsequent Nov. 21 council meeting, Seagraves felt councilmembers understood the situation and were sympathetic to the situation that AAPAC has operated under for the past few years. That’s all positive, he said. In reviewing the proposed ordinance changes, Seagraves noted that the biggest change would be the funding reduction from 1% to 0.5% – but it would return to full funding at 1% in fiscal 2016. [The city's fiscal year starts on July 1 and runs through June 30.] He clarified that the proposal to return funds to their original source after three years, if unspent or unencumbered for specific projects, would apply to funding that’s allocated to the Percent for Art program starting in FY 2013 – that is, starting on July 1, 2012. The proposal includes an option of an unlimited number of six-month extensions for funds that haven’t been spent or encumbered, he noted. Existing funds wouldn’t be affected, he said, but the wording on that part of the ordinance revision is unclear. He said he expects the wording will be changed before the final vote, to clarify that existing Percent for Art funds will be exempt from the three-year spending rule. Connie Brown raised some concern about funding for art at the Fuller Road Station project. She observed that since the overall project has been delayed, it’s unclear how long it will take before the public art funding for that is available. Seagraves said that because those funds are tied to a specific capital project – not part of the pooled Percent for Art funds – the three-year rule won’t apply. Malverne Winborne wondered “who’s the timekeeper?” With football, he said, there are 60 minutes in the game but it typically takes three hours to play, because of timeouts and other factors. With public art projects, there are many things out of AAPAC’s control that might delay a project, he said. Each project has its own clock, and the question is “do we own the clock?” he said. Parker spoke at length about her concerns. She contended that councilmembers didn’t seem to hear about all the projects AAPAC had in the works, which had been described to the council at the Nov. 14 working session. They didn’t seem to hear that the program needs more administrative staff time, she said. Rather, councilmembers intimated that AAPAC has bungled the program and hadn’t successfully finished enough projects, Parker said. The idea of returning funds that haven’t been spent or encumbered after three years is an “incredible kink in the road,” Parker contended. Every project takes a different length of time, she said, and this ordinance change will make it a lot harder to do projects. The council also didn’t address the fact that it’s been taking longer to do projects because of a lack of administrative support, Parker said. [During council deliberations, Margie Teall among others mentioned lack of staff support to the commission.] Currently, spending on administration is capped at 8% of total public art funding – it should be 16%, she said. If the council wants AAPAC to do more projects, more quickly, she added, then they need to provide the administrative support for that. By way of additional background, at the council’s Nov. 14 work session, Sue McCormick had alluded to an 8% limit on administrative costs – the costs associated with the functioning of the commission itself (for example, keeping meeting minutes, among other items). The 8% limit is not a part of the public art ordinance. By way of comparison, the city’s greenbelt program operates under the legal limit of a 6% cap on administrative costs, though it has expended considerably less than that – 1.5% for the most recent fiscal year. The 8% limit would still be in effect for public art administrative costs, McCormick had explained. She also recommended increasing the contract for the city’s public art administrator by $35,000 – moving the position from part-time to full-time status, but still as a contract employee. At AAPAC’s Nov. 30 meeting, Seagraves noted that the percentage for administration isn’t written into the Percent for Art ordinance – it’s a separate issue, he said. He noted that McCormick is working on a way to increase funding for public art administration. “It’s not a separate issue,” Parker replied. It’s a step in how the ordinance was developed, she said, and it’s important to say that. It would be a recipe for failure if Seagraves has to do all the work as a part-time employee, she said. Parker said the council asked AAPAC to examine its policies and procedures, and AAPAC did that faithfully. Yet all that work has been swept under the rug, she said. The reason why things haven’t moved faster is that volunteers are doing the work, she said, referring to AAPAC commissioners. And those volunteers have just about worn themselves out, she said. There was some uncertainty among commissioners about how the 8% amount for administration is allocated. Brown noted that if the 8% isn’t part of the ordinance, it’s important to understand how that’s managed. In addition to the public art administrator, city project managers – for the municipal center building, for example, or the proposed Fuller Road Station – spend part of their time managing the project’s public art component. Cheryl Zuellig wondered whether Seagraves could take on additional project management responsibilities related to public art projects, in addition to his part-time job as public art administrator. Marsha Chamberlin indicated that would be possible. Parker said that since the council is looking to cut Percent for Art funding in half, and is pointing to money that hasn’t been used as a rationale for doing that, then this issue of administrative costs needs to be raised. During the discussion, Parker criticized Chamberlin for not attending the Nov. 21 council meeting. Chamberlin replied that she has attended previous meetings and has been doing a lot of behind-the-scenes communications with councilmembers as well. Parker said she felt councilmembers aren’t giving AAPAC credit for work that’s been done. If AAPAC doesn’t insist that more funding be allocated to administration prior to council’s final vote on the ordinance revisions, then it won’t happen, she said. When Seagraves replied that the issue is being addressed by McCormick, Parker pressed for details. Seagraves said he wasn’t sure how McCormick was planning to handle it, but that she planned to make a recommendation to the council at some point about increasing the budget for public art administration. AAPAC needs to know what that recommendation will be, Parker said. Councilmembers who’ve been supportive of the Percent for Art program are now willing to back a funding cut, she said, because they feel the program isn’t running well. This needs to be addressed before the council’s final vote, she said. Chamberlin wondered whether Parker felt that these issues weren’t covered adequately by McCormick at the Nov. 14 council work session. Parker replied that the council didn’t discuss the issues at their Nov. 21 meeting, when they gave initial approval to the ordinance changes. She implied that since the issues weren’t discussed, councilmembers hadn’t grasped their significance. Cheryl Zuellig suggested that commissioners could speak during public commentary on Dec. 5, getting it on the record that AAPAC is working with McCormick and others on the project management issue, which they’ve identified as a challenge. They could present it in a proactive way, she said. Wiltrud Simbuerger also supported speaking to the council on Dec. 5, telling the council how AAPAC feels about the proposed changes. It would send a bad message, she said, if the reaction by council to problems that arise in the program is simply to cut the budget – commissioners need to respond to that. Chamberlin observed that there seems to be a perception among commissioners that there hasn’t been adequate reaction to these proposed ordinance changes. She said she’s had private communication with councilmembers, and wondered whether other commissioners have as well. Simbuerger replied that it was important to make a public statement, in addition to whatever other communication occurred. Malverne Winborne said he felt “lost in the weeds.” The commissioners all had opinions, he said, but he wasn’t sure they knew what they were talking about – or rather, he added, he didn’t know. AAPAC now has a project management process in place that hasn’t been allowed to operate for very long. As a volunteer, Winborne said, he doesn’t have time to handle the workload that’s been expected of commissioners. As for staff, if there isn’t enough staff time to manage the projects, then AAPAC should go to the city council and communicate that. But the elephant in the room is the political reality of the situation, he said. There are underlying political issues that AAPAC needs to be realistic about. Everyone’s being cut, but until now, the Percent for Art program hasn’t been cut. The question is – do they have the votes on the council or not? he said. Parker told Chamberlin that it’s important to lobby privately, but it’s also necessary to turn out in public, because that makes it a lot more difficult for councilmembers to vote for the cuts. Council is trying to cut a very small program in half, when nothing else is being cut that much, she said. At the end of the Nov. 30 meeting, Parker brought up the issue of the proposed ordinance revision again, asking to know which commissioners planned to speak at the Dec. 5 city council meeting. Commissioners were initially silent. Then Connie Brown noted that they’d indicated they would state that the program is important. But who is coming? Parker wondered. Again, Chamberlin asked whether they really wanted to pick a fight with the council. She said she has another commitment that night, and from talking with councilmembers, it seems clear that they understand how AAPAC feels. The council has also heard from the public, Chamberlin said, because Parker has done a good job in organizing that. So the question is how much does AAPAC want to do beyond that, she said. Winborne noted that commissioners serve at the pleasure of the mayor. [The commissioners are nominated by the mayor, and confirmed by the entire city council.] Is it their job to advocate for something they’ve been assigned to? he asked. It seemed to him that AAPAC’s role is to lay out their approach and agenda. If they’re not wanted, the council can get rid AAPAC, and he wouldn’t fight that. “Decommission me – what the hell,” he said. AAPAC’s job is to represent the public in terms of distributing public art around the city, he concluded. Having at least two commissioners at the meeting, in addition to members of the public, would be very powerful, Parker said. It’s not picking a fight – it’s stating what’s important. And it has to be restated, because there now different councilmembers on board, she said. Chamberlin concluded the discussion by saying she’d urge anyone who can attend the Dec. 5 meeting to do so, and that she’d try to change her schedule so that she could attend, too. AAPAC discussed and voted on two projects that had been presented at the group’s Oct. 26 meeting: (1) public art in a rain garden at the corner of Kingsley and First, and (2) a partnership with the Detroit Institute of Art. At AAPAC’s Oct. 26 meeting, Patrick Judd of Conservation Design Forum and Jerry Hancock, Ann Arbor’s stormwater and floodplain programs coordinator, had talked to commissioners about possible public art in a rain garden that’s being designed for property at the corner of Kingsley and First. The city is buying 215 and 219 W. Kingsley – land that’s located in a floodplain. A boarded-up house is located on the corner lot; the adjacent lot is vacant. The city received a grant from the Federal Emergency Management Agency (FEMA) to demolish the house and stabilize the site. The city has awarded Conservation Design Forum (CDF) the contract for the project, which will include building a rain garden on the site. CDF was also involved in the new municipal center project and the Dreiseitl sculpture. 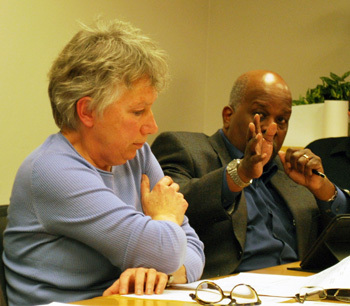 At AAPAC’s Nov. 30 meeting, Cheryl Zuellig reviewed the proposal. Advantages of putting public art there include the fact that it will be on city-owned land in a visible and accessible location, because the street serves as a cut-through for motorists trying to avoid Main Street. Another advantage is that it’s a project supported by city staff, she noted, and the project’s designer is willing to integrate public art into his work. Cons to the project include somewhat limited public visibility – it’s a relatively small site, and not on a major thoroughfare. Zuellig said she’d been on the fence about it. It’s not part of AAPAC’s annual public art plan, but the overall rain garden project is part of the city’s capital improvements plan (CIP). Although there’s $27,000 in funding available, Zuellig wasn’t sure they should spend that full amount, and wondered whether $10,000 would be an appropriate figure. Malverne Winborne wanted commissioners to at least think about the fact that this project isn’t in their annual plan. In the context of concerns over AAPAC’s ability to get projects done in a certain timeframe, he didn’t want them to lose focus on what they’d already said they’d do. Zuellig said this question came up with the West Park sculpture project, too. Like the rain garden, public art in West Park was initiated by the city and tied to renovations there, but hadn’t been part of AAPAC’s annual plan. In the past, AAPAC has accepted projects if they are tied to the CIP or proposed by city staff, she said. Commissioners can change that stance, she added, but that’s what they’ve done to date. She said they should think about the implications of saying no to projects like this – what message will it send to city staff? Marsha Chamberlin noted that since the Fuller Road Station project is on hold, that frees up some time to take on something else. She characterized the rain garden as an interesting project, in a different part of town from other art installations. Aaron Seagraves, the city’s public art administrator, said he didn’t think AAPAC should limit projects only to those in its annual plan. The plan is designed to be a guideline, but does not bind their work. In response to a question from Connie Brown, he said installation for the public art piece in the rain garden would likely happen in the spring. Referring to a conversation that commissioners had earlier in the meeting, Margaret Parker said this situation illustrates the “jaws” of their dilemma. On the one hand, they face pressure to move more projects along quickly. On the other hand, she isn’t confident they have the administrative support to take it on. Aside from those concerns, she said, it’s a great project, and would support using the entire $27,000 to fund it. Brown asked Seagraves whether he felt he could manage it, given that Fuller Road Station is delayed. Yes, he said. In that case, Brown said she’d support the project, but felt that $27,000 was too much. Wiltrud Simbuerger called it a great opportunity. They could do the project quickly – and it’s important to have a range of projects, she said, both smaller and larger projects that would take longer to complete. As head of AAPAC’s mural program, she noted that the $10,000-per-mural that they had approved was really insufficient, so she supported allocating more for the rain garden. Perhaps $20,000 was the right amount, she said. Chamberlin indicated that it might be possible to pay Seagraves to manage the project, in addition to his part-time administrative role. She agreed on the need for a higher budget – for the West Park sculpture, she noted that the artist had absorbed much of the costs, because the budget had been too low. She supported using the full $27,000. Winborne said he’s not opposed to the project, but is concerned about possible “scope creep.” He wants a process that doesn’t let AAPAC lose focus. They need to be vigilant when things like this pop up. That said, this project is low-hanging fruit and can be done quickly, he said, and he’d support it. After additional discussion, commissioners voted on a resolution to accept the project for public art in the Kingsley rain garden and to create a task force to work on it. The resolution recommends funding the project at between $20,000 to $27,000, with the final recommendation for funding to come from the task force. Outcome: Commissioners unanimously approved the Kingsley rain garden public art project. At AAPAC’s Oct. 26 meeting, commissioners met with Larry Baranski, director of public programs for the Detroit Institute of Arts, regarding the DIA’s Inside|Out project. The project involves installing framed reproductions from the DIA’s collection at outdoor locations on building facades or in parks. In 2010 the DIA installed 40 works within 60 miles of Detroit, including two pieces in Ann Arbor: One on the exterior of Zingerman’s Deli on Detroit Street, and another reproduction on the Borders building on East Liberty. The DIA is planning an expanded program in 2012, funded by the Knight Foundation. Each community will have between five to eight installations grouped within a one-mile radius. Communities will participate during one of two periods: from April through June, or July through September. DIA would provide the framed reproductions, printed materials to distribute, and informational labels for the artwork – including a QR code that links to a website with an animated feature on the program. The DIA pays for everything, including the cost of installation and liability insurance. The frames are mounted to the building walls by customized brackets. The DIA will also replace any work that’s stolen or damaged by vandalism, or will remove it if requested. At AAPAC’s Nov. 30 meeting, Marsha Chamberlin said the partnership would involve the city simply selecting seven sites on city-owned property. Malverne Winborne supported it, with the caveat that the commitment on the city’s part was limited to site selection. Outcome: Commissioners voted unanimously to approve the partnership with the DIA for the Inside|Out project. Dreiseitl sculpture: There’s no completion date set for the water sculpture by Herbert Dreiseitl. A formal dedication took place in October, but since then the blue lights and flowing water have been turned off so that additional work could be done. Seagraves said he didn’t know what the hold up is. Justice Center artwork: On Dec. 12, the selection committee for artwork in the Justice Center lobby will meet with finalists and see presentations of the artists’ proposals. The meeting will not be open to the public, Seagraves said, but other commissioners can attend. Fuller Road Station: Because the overall project has been delayed, possibly by as much as 6-12 months, Seagraves said the art component is also on hold. A task force had previously been formed for the project, but will wait until the rest of the project moves forward before continuing its work. Mural at Allmendinger Park: The deadline for the four finalists to submit preliminary concepts is Dec. 8. The four finalists are: (1) Robert Delgado of Los Angeles, Calif.; (2) Bethany Kalk of Moorehead, Kentucky; (3) Jefferson Nelson of Liberty Center, Ohio; and (4) Mary Thiefels of Ann Arbor. The mural has a budget of $10,000. Stadium Bridges: A task force is being formed for the public art component of the Stadium bridges reconstruction, and will hold its initial meeting on Dec. 5. Later in the meeting, Seagraves also briefed commissioners on proposed changes to a document outlining the steps for completing public art projects through the Percent for Art program. [.pdf of draft project steps document] Commissioners discussed the need to streamline the steps even more, and proposed that Seagraves work with Connie Brown to refine it before bringing it back to the full commission at their Dec. 13 meeting. The proposal calls for selecting curators – such as a gallery owner, arts advocate, artist representative, or art curator – who in turn would present AAPAC with potential artwork to acquire, based on certain selection criteria. At the same time, AAPAC and city staff would identify possible locations for artwork. A selection panel would evaluate and decide whether to recommend purchasing the work that’s been submitted by curators. There would also be a public opinion component involved in selecting art for each location. Seagraves suggested reviewing the draft proposal and discussing it at a future meeting. Some commissioners raised concerns over how curators would be paid. It’s common for such work to be handled on a commission basis, Zuellig said. Connie Brown said she was uncomfortable with that, and would prefer to pay a fee to a consultant instead. Seagraves indicated that this was an initial draft, and he could investigate how other cities handle this kind of procurement process. Malvern Winborne wondered if this program was a “nice to do” or a “need to do.” He said he’d always bring up that point, to keep their focus. Margaret Parker pointed out that this effort is in direct response to concerns that city councilmembers had raised about AAPAC not getting enough public art into the community quickly. Chamberlin suggested putting it as an agenda item for AAPAC’s meeting in January or February. AAPAC’s regular meetings are set for the fourth Wednesday of the month. The December meeting would fall on Dec. 28, between Christmas and New Year’s. After some discussion, commissioners decided to switch the date to Dec. 13 instead. At the meeting, commissioners plan to follow up on an Oct. 26 working session held to prep for a presentation to city council on Nov. 14. Marsha Chamberlin suggested that they take the ideas and challenges identified at that October work session, and decide how to move forward. She noted that the discussion would dovetail nicely with development of the annual public art plan, which the commission needs to complete by April. Commissioners present: Connie Rizzolo-Brown, Marsha Chamberlin, Margaret Parker, Wiltrud Simbuerger, Malverne Winborne, Cheryl Zuellig. Also Aaron Seagraves, the city’s public art administrator. Absent: Tony Derezinski, Cathy Gendron, Elaine Sims. The Chronicle relies in part on regular voluntary subscriptions to support our coverage of publicly-funded programs like the Percent for Art, which is overseen by the Ann Arbor public art commission. Click this link for details: Subscribe to The Chronicle. Mary Thiefels is awesome, and money to her would stay in the community. I hope she gets the commission. Did I miss something? I don’t recall ever even seeing a project timeline, let alone a delay. Let’s just make sure, like the request for proposals clearly states, the art reflects the ‘political’ values of the community. Oh, I don’t know, maybe a couple of homeless people freezing to death next to the City Center water fountain? That would make a nice mural. Might that be Roberto Delgado of Los Angeles, Calif. Not that I know him. Google only found a Roberto who was a muralist. And I am not saying you got it wrong, maybe the AAPAC has it anglo-sized. Or maybe Roberto goes by either. I’m with Ed. Did I miss something where City Council voted to approve Fuller Road Station?? The issue of Fuller Road Station has raised concerns for several members of PAC dating back nearly two years. The large parking structure, bus depot and possible rail station is proposed near the intersection of Fuller Road and Maiden Lane, near the University of Michigan medical campus on city-owned land. The land has been used as a surface parking lot since 1993, leased to the university, but is on property designated as parkland. It’s a joint project of the city of Ann Arbor and UM, but a formal agreement regarding its construction and operation hasn’t yet been finalized. So in the spirit of answering a rhetorical question: No, city council hasn’t taken a vote to approve the project. I believe the last vote taken that directly related to Fuller Road Station was in November 2009, when councilmembers approved a memorandum of understanding between the city and UM regarding the project. [.pdf file of MOU between Ann Arbor and UM] At that time, it was expected that the first phase – the parking structure – would be completed in mid-2012. Park commissioners have asked to be provided with a contract of whatever agreement is eventually reached between the city and UM, prior to any vote by council, so that they can review it and hold a public hearing on the project. That hasn’t yet happened. The city itself–the architecture of the buildings, the fashion of the pedestrians, the overall urban fabric–this composes the “art” that is the city. City-sponsored public art projects tend to be sterile, cold, predictable, dull, and don’t contribute much of substance to this fabric. Enhance the city’s artistic fabric by legalizing graffiti on public, concrete surfaces such as bridge underpasses and the like. Graffiti is an authentic urban art form, unlike abstract steel sculpture. Spend the 1% on that public warming shelter or something else that the city genuinely needs and that can only be provided by the government. I second what Jordan said. Every city does murals. We have a few good ones. We don’t have to repeat what has already been done ad nauseum in other places. Please, no more murals. They’re prone to tagging and look bad after a couple of years without continuing maintenance. $$. The AAPAC commissioners don’t sound like creative people when all they do is copy what other cities do. So far all they have done and propose will further homogenize the look and feel of Ann Arbor. Yes and many places invest in those lesser pieces which happen to be public structures (bus shelters, public toilets, etc) and make them special. Here it seems that we decorate (paint over) the normal city clutter instead of using our resources to design away that clutter (think elec/telephone boxes and amateurishly painted water tower). The Fuller Road Station, even though it is not a small structure, also smacks of that, which is why I am not enthusiastic. Build a dull warehouse for cars and throw a graphic in the windows… or above the door… or out front and call it done. How about just designing a nicer building. In Europe the architects design the art that they add and integrate it into the overall concept. it might be best to do this project in the summer, as students will be away, the michigan daily won’t talk about it and staff/professors will be too busy with summer. from a public relations standpoint, its best to sneak it in during the summer to avoid the negative press. create whatever delay (fictional or not) is necessary to get it in the summer. I recall an incident of a homeless woman freezing to death in Washington D.C. on the front steps of HUD national HQ. The incident was such an embarrassment to the Clinton administration, it forced increased funding to homeless programs. Guessing even that wouldn’t work here for more funding. Maybe if someone froze to death on the steps of SPARK? @Tom Whitaker. Sending millions to SPARK without even an option to check their financials or have any clearly defined measurable outcomes is just reflecting the political values of our Community. That’s what the City Council and County Commision are all about. “Values”. Maybe if I got the shirts and other closing from those ‘homeless’ and made a giant ‘tunnel’ I could get City funding? Lol. You know, made an expensive piece of art that reflects the pathos and conflicts of the ‘lower class’?